"Nothing quenches your thirst and puts you in a better mood than Homeopathic Vodka. Thank you for everything you have done for womankind!" "I wish I could say "the best invention since sliced bread" but, as Homeopathic Vodka has been around since the earth was created 6000 years ago, it is the best invention EVER." "Wow - what a fresh clean clear taste. I can't believe it's not water!" 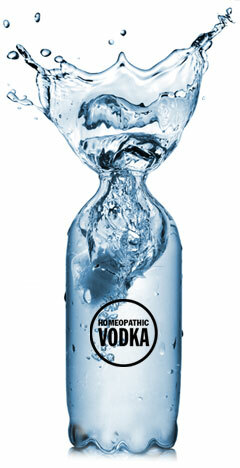 "You have made Homeopathy and Homeopathic Vodka accessible to the masses. Samual Hahnemann would be proud!" "Finally!! Someone who really understands what Samuel Hahnemann was talking about. This will surely silence all of his critics! I raise my glass of Homeopathic Vodka to you." "We've started putting Homeopathic Vodka in the water bottles for my 9 year old son's soccer team - they are feeling refreshed and energized with every drink!" "Until you came along, I spent years trying to perfect my Homeopathic Vodka at home. You've made it so simple! Thank You!" "Just so you know, we have figured out how to make Homeopathic Vodka in larger batches. You just need to apply 4 labels(Seals) to the front of a 5 Gallon Water Jug. 5 labels(Seals) is too much and 3 labels just doesn't leave the right taste."